I've been smelling fuel (only on a full tank) for about a year now but today was the first time it showed the EVAP code. I cleared the code and drove to 1/4 tank then filled up. The smell is still there but the code didn't come back. VW checked it for liquid leaks last year and didn't find any. I'm gone to either have them look at it more and/or do it myself. What was the labor cost to drop the tank? I'm going to get an estimate on that too. I'm out of town the rest of this month. I'll get my wife to take a photo of the invoice and I'll post it up here. Hopefully these MP4 videos load automatically . . . 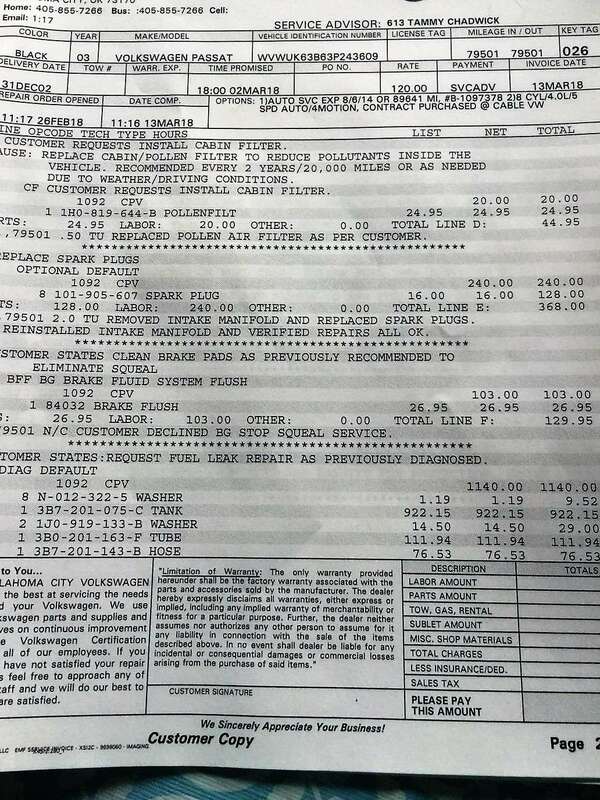 I did the 80K mile service as well, but this page of the invoice lists the lab0r and parts for replacing the tank. I like that smoke test, didn't know about that and will have them do it. Thanks for the invoice, on the gas tank replacement, what is "CPV"? Okay, thanks. Now I know what I'm up against at least for labor if the tank needs to come out. I will have to go back to the dealer and ask about that EVAP smoke test. They can't find a leak, not even with the smoke test, but I smell it. After fill up, do you have evidence of a leak on our garage floor? Yes, it leaks (only recently) anything above 3/4 of a tank. I talked to the dealer a while back and they said that this recall check was done in 2009 on my car and no leak was found. He said that until they drop the tank to see what's leaking that he can't tell if it'll be covered by the recall and he said that he doesn't know if VW will cover it since it was previously checked. I voiced my opinion about regardless of the check if it is the recall problem then it needs to be fixed for free. I'm going to let them drop the tank after the new year, we'll see the results of this problem. They've always done me right in the past. What I do find interesting is that the recall for the Audi version of this recall says to epoxy the tank since they are NLA. This page was generated in 0,058 seconds.